You’d think that when a well respected artist with pretty good name recognition scores hits with an up and coming record label – the label’s first national hit no less – that re-signing that artist would be a priority. You’d think this would be even more likely if you knew the record label in question was Atlantic, by no means the universally respected company they’d soon become but by early 1949 at least they’d shown some decent instincts and they had a personal affinity for the type of high quality musician that described someone like guitarist Tiny Grimes. You’d think the two entities would therefore go on to a long and fruitful relationship, one beneficial to both parties, as Atlantic would have a skilled artist with a crack band that was conversant in both jazz and rock ‘n’ roll and just as importantly willing to play both rather than stubbornly sticking to only one, while Grimes himself would have a company that had genuine musical aptitude and enough distribution clout that they’d been able to get him that national hit along with a few other regional hits in their year and a half together. You’d think that getting his name on the dotted line would be but a mere formality, for why would Atlantic risk losing their biggest moneymaker, let alone to a company that was in no better position than they were, either in terms of potential to score a hit or in the money they were able to offer him. But if that’s what you thought you’d be wrong, because as of mid-1949 Tiny Grimes was no longer employed by Atlantic Records and now embarked on stage two of his rock years odyssey with rival Gotham Records. Grimes’s releases on Atlantic are by no means over and done with, as the company still had a handful of songs on the shelf to put out over the next year and that’s not even counting his eventual return to the label a few years down the line, but since this marks his first effort with Gotham this is when we need to focus on it to figure out what happened. Well… actually it’s NOT quite his first effort with Gotham after all, for maybe you remember that the gospel group turned rock ‘n’ roll hopefuls The Dixieaires had released a follow-up to their lone national hit Go Long (September 1948) a few months later in November called Things Got Tough Again which was written by Tiny Grimes who also played guitar on it. Maybe that has something to do with these new contractual arrangements. Maybe Grimes was impressed by something Gotham did, which could’ve been anything from a cash bonus for their efforts or even something as innocuous as serving them more than just sandwiches and stale potato chips for lunch. But Grimes still was employed to Atlantic who might not have been altogether pleased that their most reliable artist was gallivanting around in Philadelphia with another group on another label. It’s doubtful they’d have been so piqued that they’d have pre-maturely jettisoned him, though it’s worth noting that Grimes was gone before the usual two year period was fully up – which would’ve been the fall of ’49 with Atlantic. Maybe his deal called for just a certain number of sides to be cut, after which he’d be a free agent, which is probably more likely considering the circumstances. Whatever the case may be, Grimes had his last recording session for Atlantic in March 1949 and a few months later was cutting for Gotham. His band tagged along as you’d expect, with tenor saxman Red Prysock being the most vital collaborator, not just in terms of sharing the lead instrumental role but because that role is a large part of what ensured it’d find favor with the rock audience. 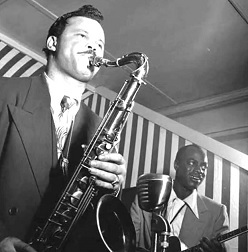 Though saxophones were certainly prevalent in jazz, they were the centerpiece of rock in 1949 and Prysock was so good that he could be used sparingly to allow Grimes more of the spotlight yet still deliver his part with the explosiveness that would create a buzz among rock listeners. If there was any question as to what style of music Grimes – and by extension Gotham Records – were going to pursue out of the gate, Drivin’ & Jivin’ answers it in no time flat. Though you could argue that his shift from jazz to rock at Atlantic might’ve been somewhat circumstantial, as the upstart label were desperate for whatever might sell to keep their company afloat, here Grimes reconfirms his own commitment to rock ‘n’ roll and shows that it was in his nature all along to move away from the acceptable styles he’d once called home. One of the subtly recurring themes we’ve touched upon from time to time is the willingness of bandleaders to divert attention from themselves, in this case giving it to Prysock, without feeling threatened by the competition on record. It might be that really skilled artists are by nature more confident OF those skills and thus aren’t worried about having those skills go unrecognized, but there’s still plenty who insist on grabbing as much spotlight as they can each time out, if only to show WHY they’re the big star. When somebody comes along who subverts that egocentric mindset, like Big Jay McNeely or Tiny Grimes, it’s not only refreshing to see as an example of the better side of humanity, but it’s also telling that it works so consistently well. On Drivin’ & Jivin’ the two leads Grimes and Prysock, or Prysock and Grimes if you prefer, are at equal strength, two titans on their instruments at the peak of the powers. The title itself may not have been explicitly intended to represent these two men but you could make much broader assumptions than to suggest that it was a title that came naturally after hearing the two go at it on the studio floor. It’s probably safe to say that if this was indeed the case then Grimes is the one who is jivin’, even though what he launches this with is more of a driving sound, accelerating out of the gate and setting the mood it’d ride to the finish, one of impatient revelry, like those trapped all week at a stifling job who finally get to blow off steam, not to mention blow their paycheck, at a club by drinking too much, dancing with whoever catches their eye and – if everything breaks right – catching whatever the public health board voted as the Venereal Disease Of The Month. Grimes, as always, plays riffs with real bite to them, tearing jagged pieces of flesh from the song with short but emphatic power and deadly precision. He never overstays his welcome, never tries something difficult just to impress, his lines have melodic and rhythmic purpose to them as well as keeping the intended atmosphere intact. It’s a clean sound, yet not at all a light and easy to overlook sound as a lot of guitarists were featuring at the time. He captures your attention without going overboard to draw in the first place. As he gives way to Prysock he steps out of the spotlight without ceding the stage to the sax player altogether and whether he’s merely keeping the rhythm churning along underneath or tossing in some scalding accent notes, his touch remains letter perfect and he gives the impression that he’s a bigger part of the arrangement than he actually is. After we’ve just gotten saying how important Grimes is in maintaining the right feel on this song, how he’s magnanimous in sharing the lead with another band member who is subordinate to him in the group’s pecking order, we have to say that Drivin’ And Jivin’ is, for all intent and purposes, a Red Prysock record under the guise of Tiny Grimes. It’s Prysock who gets not only the biggest part, but the primary one in terms of excitement. Grimes’s guitar gets you on the edge of your seat for sure, building anticipation early and releasing the pressure later with his fills, but the one who cranks up the heat and gets this boiling throughout the record is Prysock who is shaping up to be one of the better tenor sax stars of this era, even though his recognition – then as well as in the years since – is somewhat lacking compared to others whose own names adorned the records they made as lead artists. Though Grimes tackles the lead for most of the first half of the record with some flashy runs while Prysock plays the churning riff behind him, that’s not quite what you’ll remember when this is over because a minute into the proceedings they essentially switch roles and Grimes plays the rhythm line while Prysock takes over on the lead and he doesn’t disappoint. In many ways this could be offered up as a blueprint of what you want out of your featured tenor sax on a rock record in 1949. He starts off his solo with gradually increasing emphasis, making sure to keep to the lower end of his range without resorting to guttural intermittent honks. He’s more growling, or revving an engine at this point, making you aware of his creeping presence as Grimes gives way and Prysock steps into the forefront. As transitions go it’s expertly conceived and carried off. The shift is seamless, the two instruments, as disparate as their sonic textures are, come off sounding as it they were joined at the hip, each one exhibiting a feral quality that keeps the mood tense and edgy. But whereas Grimes’s guitar relied on quick strikes like a snake, Prysock displays the power the more this goes on, like an alligator clamping its jaws on your leg. His lung capacity – don’t laugh, it’s important in this line of work – is first rate. Often we’ve seen guys cut lines short, or blow themselves blue in the face and start to wheeze the more they’re asked to deliver, but Prysock never lets up. He maintains his tone on each line, whether long or short, high or low, melodically drawn out or rhythmically sudden and brief. He sounds so self-assured with how and what he plays that you can’t help but get caught up in his enthusiasm. When he comes out of a more modest interlude by blasting notes like exclamation points it’s the musical equivalent of a Wildcat fighter pilot in World War Two pulling up out of a bombing run with guns firing and engines screaming. If you’re on the ground looking up at this you want to alternately dive for cover and watch the action unfold at the same time. When the two lead instruments both hit their high point to conclude that impressive run it’s with a surprisingly cohesive sound, the climax of the battle which quickly – and satisfyingly – winds down to an entirely natural and almost soothing conclusion. If you were an aspiring arranger trying to learn how to put a rock instrumental together for maximum impact and efficiency then Drivin’ & Jivin’ might be the only lesson you’d need. So why then has this record been all but forgotten, if it were ever really known at all? Well, the clues are scattered throughout this review, almost in every paragraph there’s something to explain it’s lack of success at the time and long term recognition for it’s compact explosiveness. For starters there’s the fact that Red Prysock is not the credited artist, Tiny Grimes is, and while Grimes’s contributions are significant there’s no denying that Drivin’ & Jivin’ would be best suited in the discussion for great tenor sax instrumentals. Even though Prysock made his name as Tiny’s right hand man for a half dozen years it’s still the name Tiny Grimes that adorns the record and it’s odd to say that one of the better sax instrumentals belongs to a guitarist! Then there’s the fact that Grimes himself has sort of a black mark against his name in some circles thanks to his abandoning jazz at the moment jazz could’ve used him to help it transition from the big band era it was leaving behind to something different, something that might’ve staved off its commercial decline. He’s certainly remembered more for his earlier turns as a jazz visionary, but he’s not fully embraced by that constituency either, and even if he were these forays into pure rock ‘n’ roll wouldn’t be what they’d want to celebrate. Rock fans haven’t picked up the slack in that regard either as he came along too early in rock’s ascent for most to be aware of his contributions and his iconoclastic nature meant he would still be prone to jumping into other fields far too often for most rock enthusiasts to be comfortable with. Of course it’s also hard to dispute that had he stayed with Atlantic Records for another six months and delivered this performance for that far more storied label he might get a little more attention for it, since few independent companies have had their histories as exhaustively documented as Atlantic, whereas Gotham Records, even though it hung around for a decade, saw no such efforts to glorify their output along the way. Lastly, as good as it is, it wasn’t a national hit and since so many rock records by the latter days of 1949 were charting it makes one that missed out seem rather unimportant by contrast. All of those reasons are perfectly understandable when looking for reasons why Drivin’ & Jivin’ has slipped under the proverbial radar for so long and you really can’t dispute any of them when it comes to understanding its lack of recognition. But none of those reasons hold up for long once you hit play and hear two of the best musicians on their instruments that rock has ever seen going for broke and laying waste to the competition in this field. How they ever were allowed to get away from Atlantic and head elsewhere defies rational thought. But then you just cue the record up again so you don’t have to think about anything other than the sound and fury that emanates from the speakers before they’re reduced to ashes by the power of their playing. 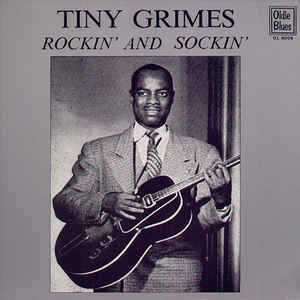 Leave a reply on "Tiny Grimes: “Drivin’ & Jivin”"